We've structured our investigations following the thoughts of Lauren Isaac (2016), who proposes that the positive or negative effects of AV's largely rest on whether AV's end up being privately owned or shared among several users. In this post, we look at shared AV scenarios. For these shared AV scenarios, we assume that a shared AV would operate as ride sharing services do today: an individual hails a ride through an app, the AV collects them, and the AV delivers them to their destination for a fare. The AV would then pick up the next person that hails a ride. We start with our CityCast implementation in Asheville, North Carolina. First, we predict which synthetic individuals are likely to privately own (conventional) vehicles based on their employment status, income, and household structure using a common auto ownership model. Then, we replace a portion of the conventional vehicle fleet with shared AV's. 10% Random Fleet Replacement 1:1 ("Random") Ten percent of private (conventional) vehicles are randomly replaced with shared AV's in a 1:1 ratio. 10% Random Fleet Replacement 10:1 ("Small Fleet") Ten percent of private (conventional) vehicles are randomly replaced with shared AV's in a 10:1 ratio. This makes the assumption that one shared AV could complete the trips of 10 private (conventional) vehicles. 10% Lower-Income Fleet Replacement 1:1 ("Lower-Income") Ten percent of private (conventional) vehicles are replaced with shared AV's in a 1:1 ratio. Rather than assuming that the replacement is random, we assume that lower- and middle-income households are more likely to give up their private vehicles. 10% Random Fleet Replacement 1:1 with Better Utility ("Better Utility") Ten percent of private (conventional) vehicles are randomly replaced with shared AV's in a 1:1 ratio. Rather than assuming that the disutility of travel is about equal between conventional vehicles and shared AV's, we assume that the shared AV trips have a better utility. All scenarios use the same population with the individuals traveling to the same activities. It is possible (and likely) that in the medium- to long-term, AV's will change individual and household activity patterns. But this model is especially designed to look at short-term effects, so holding the demand constant is not inappropriate. The table below shows the mode share in each scenario. Keep in mind that these are estimates from a simulation based on many assumptions we've made, and don't likely match actual conditions in Asheville. Overall, shared AV's take about 10% of the private (conventional) vehicle trips and 10% of the transit trips. The scenario with the most AV users is, logically, the one where AV's have the lowest fare (the Better Utility scenario). This supports the somewhat obvious hypothesis that the effect of AV's on cities will be driven most by the "cost" of them as compared to conventional vehicles, rather than by any other feature. By cost, we mean both financial cost and convenience/inconvenience costs. An interesting point observed through these simulations is that in the Small Fleet scenario the number of AV passengers is only half a percentage point lower than the other scenarios, even though there are only 1/10th as many vehicles available. This means that having a smaller shared vehicle fleet might not have hurt the options of people much. 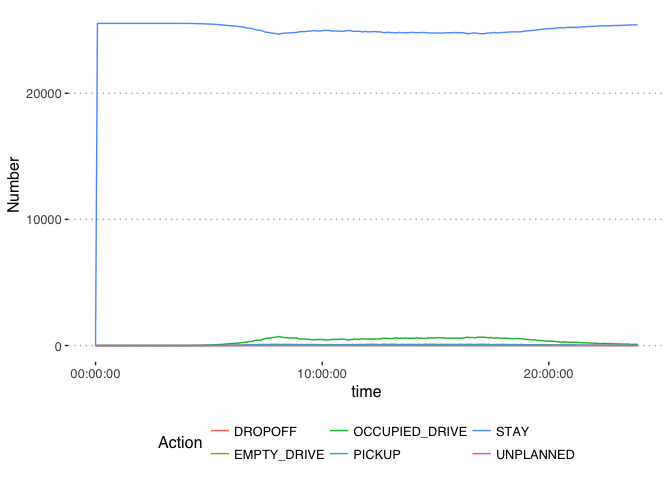 You can see this even more clearly in the utilization graphs shown below. This shows what the AV's in the simulation are doing at each minute of the day; how many are picking people up, how many are in service, etc. 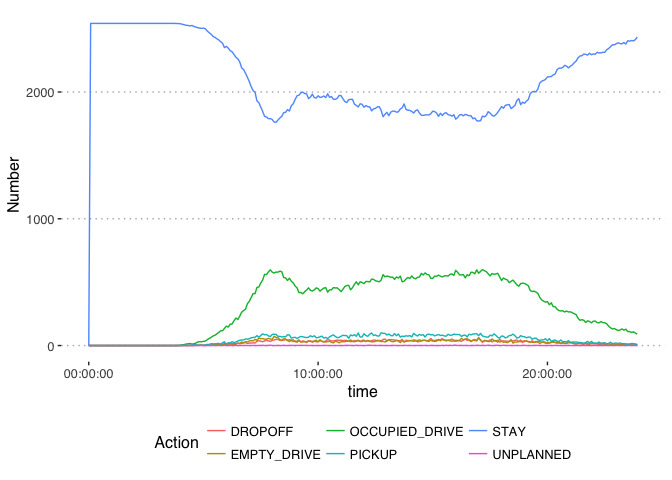 The first graph below from the Random scenario shows that about 27,000 of the 28,000 AV's in the fleet aren't doing anything throughout an average day. In the Small Fleet scenario below, there are almost 3000 AV's, most of which are still waiting around at any given point in the day, but the balance between busy vehicles and waiting vehicles is a little more even. But does having a smaller fleet mean that now people cannot get a ride when they need one? The table below shows the average and standard deviation of the wait times in each scenario. Overall, wait times are only a few seconds because in the scenarios we ran, 1 in every 10 cars on the road are shared AV's with high rates of vacancy. In the Small Fleet scenario, the average wait time only increases to about one minute (60 seconds) with some people waiting a few minutes based on the standard deviation. It is true that some people decide to take another mode instead of waiting for an AV (the AV mode share drops from 8.88% to 8.25%), but overall the system appears well-served. A primary finding from these scenarios is that if AV's are shared by people in a city, the city will probably need far fewer vehicles with less parking, and other similar pieces of infrastructure, and existing trips will be still be handled effectively. This seems very much like the Utopia that Isaac suggests, at least in the short-term before trip and behavior patterns change substantially. We will continue to explore these questions. But first, we should consider Isaac's nightmare scenario, where AV's are privately owned. Check back in a few weeks.